Is chicken stir-fry a family fave? Try our CATALINA Chicken Stir-Fry. Chicken, mixed veggies and rice get a zesty boost of flavour - thanks to a sauce of KRAFT CATALINA Dressing and soya sauce. 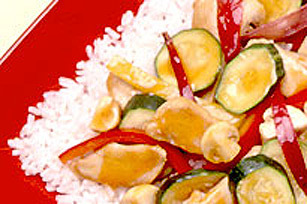 STIR-FRY chicken and vegetables in dressing and soya sauce to taste.